Line a muffin pan with 12 liners and lightly oil. Set aside. In a medium mixing bowl add the flour, almond flour, baking powder, baking soda, cinnamon and salt, mix well to combine. In the bowl of a kitchen mixer such as a KitchenAid, add the butter and sugar and beat well till light and fluffy. With the mixer on low add the eggs, one at a time and mix till incorporated. Add the sour cream, vanilla and almond extracts and mix to blend. With the mixer on low, add the flour mixture and mix until smooth. With a large rubber spatula, gently fold in the frozen blueberries being careful not to over mix. Spoon the batter into the prepared muffin pan. Sprinkle some turbine sugar on top of each muffin. Place in the oven and bake until salt, about 20-22 minutes until lightly browned on top. 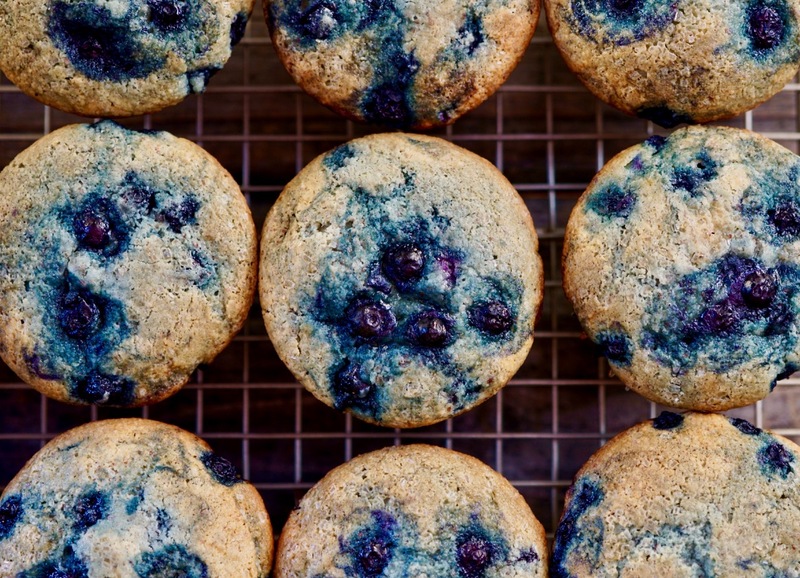 Remove the muffins from the muffin tin immediately and allow to cool on a wire rack. The perfect blueberry muffins that don't require fresh blueberries to make.